Should we protest Donald Trump? The following article is by Dr Timothy Tomkinson, a doctor currently working in the NHS. The other day I found myself watching Owen Jones on Good Morning Britain, as he discussed whether or not we should protest the visit of Donald Trump to the UK. By way of justification for this he mentioned, on this occasion and others, the fact that protesting is “a proud British tradition”. Firstly, it feels like there is a degree of arbitrary selectiveness about the protests. 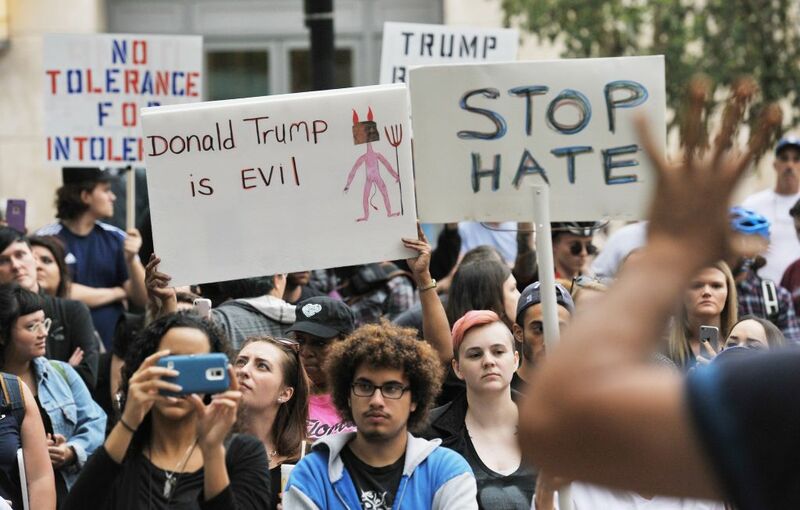 Donald Trump has long-since been identified as an acceptable figure to hate (ironically, considering the protests are nominally against hatred). If the protest is against his policies or personal actions, we should expect to see similar protests against the Saudis, against Ugandans – indeed against most non-European countries, whose social norms are very different to ours. Yet for most people, these protests are conspicuously lacking, and the ire is contained for Trump alone. However, in defence of Owen Jones, he also arranged protests against the Saudis. Secondly, and perhaps the most relevant point here, is that these protests are increasingly commonplace. Whilst we all accept the right to protest, the responsibility to use it wisely appears to have been neglected. In the past, protesting may have been used as a final measure to express group dissatisfaction at a government policy once efforts at debate and negotiation had failed (such as the Iraq war), now it happens as a default setting for serious and trifling events alike. Indeed, considering it tends to be one side of the political spectrum who protest most often, it rather comes across as an inability to accept a government, and a refusal to engage with it on a rational level. If protests become commonplace, they lose not only their impact, but also their moral validity. When war, tuition fees and a rude comment on a bus a couple of decades ago all get the same treatment, there may be a lack of perspective about the mechanism for expression. In this context, protests become merely a routine tool to express that one side of society doesn’t like the governing party, something we could surely have inferred from how they voted at the election. Finally, we should look pragmatically at these protests. As with any political movement, we must understand what it hopes to achieve. If the goal is simply there to express personal dissatisfaction with an individual, that is one thing. Indeed, I assume most attendees do not believe their protest will actually stop President Trump from visiting. Yet clearly there are many people who do not want him to come, and with this being the case it makes a big statement about international politics. It’s difficult to know if the implication is that we shouldn’t engage with America at all whilst Trump is president, or rather just that we shouldn’t try to negotiate favourable trade terms with him. Either way, non-engagement with America (as with any country), would clearly be bad for the UK. As with all these things, the negative impact will probably affect the worst-off in society most – paradoxically the group most championed by those protesting. With that in mind, it seems that these protests are an exercise in pure narcissism: a chance to get together with like-minded people and feel good about ourselves at someone’s expense – equivalent to a student protest coming onto campus and shutting down debate. As we see Sam Gyimah striking a small blow for freedom of expression and, by extension, civil discourse at universities, perhaps we should reflect similarly on what protesting does to our ability to negotiate. As for Owen Jones, it must be a nice feeling for one hundred and twenty thousand people to attend an event you’ve organised. Perhaps he could use it to feed the homeless.